Get Rich Rewards In Notes! owning the note instead of the property. I’ve been teaching this for years, and I’m offering a class that will open up huge potential for your short and long term earning. Because when you learn more, you earn more! Each type of note has its own skill set to master for you to be successful, and we cover these specific skills in this RICH REWARDS IN NOTES class. But many of the skills overlap and can be applied to either type of note. And since the goal of buying a Nonperforming Note is to turn it into a Performing Note, and you’ll learn about both in this one awesome class. 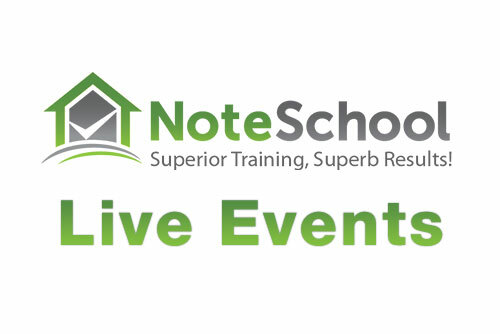 NoteSchool's Rich Rewards In Notes 3 Day Live Class! Here's a glimpse of what this live class is all about... the Rich Rewards In Notes 3-Day Live Class is highly advanced training for the non-performing notes industry. I run my Rich Rewards In Notes 3-Day Live Training a dozen times or more each year, in cities all across America. So you might be lucky enough to have one close to where you live. They are totally worth flying for and plenty of people do just that. It's also potentially tax deductible, so you get to "double dip"! It’s important to understand, these kinds of case studies are not the rare exceptions… they happen frequently! When you learn to think creatively with a goal of helping others at the same time, the potential for success is unlimited. This groundbreaking 3-day RICH REWARDS IN NOTES Class gives you everything you need to get started buying and selling both kinds of notes right in your own backyard, with very little competition. Let me sweeten the pot a little... when you register today, I'm also going to send you the recordings of a previous Rich Rewards In Notes Class. The recordings are very similar to the Class you'll be attending but with some differences too. I could sell these recordings separately for at least $500, but I don't. I keep them for Rich Rewards In Notes 3-Day Live Training attendees like you. I recognize that for some people it can be a little scary getting started. Or maybe you just want some help creating your plan. Either way, you'll be thrilled to know when you register for this 3-day RICH REWARDS IN NOTES Class, you'll get a 30-minute 1-on-1 session with one of my handpicked trainers to discuss your unique situation. I’m so excited to have you come to our live 3-day RICH REWARDS IN NOTES Class. I look forward to meeting you there... and to adding you as the next case study in my successful student portfolio. See you in person soon!